The plantar fascia is a dense, fibrous membrane which forms a strong mechanical tie between the heel and toes. The plantar fascia maintains the arch of the foot. Plantar Fasciitis refers to the inflammation of the plantar fascia and usually occurs due to repetitive stress. It is most commonly seen in people who are active in walking, standing and especially running. Occasionally, Plantar Fasciitis occurs in people who have had an acute injury to the area, a change in footwear, or a change in weight. The plantar fascia is sometimes pulled away from the bone and the body will deposit bone to repair the area. 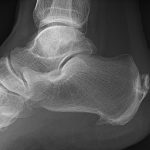 The bone deposit or heel spur is often seen on an x-ray and is a sign of the underlying problem. Read about the range of treatments, or specifically about Foot Orthotics. 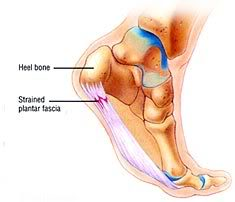 Plantar Fasciitis, also known as heel pain syndrome, is the inflammation of the plantar fascia. It usually starts as a dull, intermittent pain in the heel area and may progress to a sharp, constant pain. Typically, Plantar Fasciitis pain is worse in the morning or during the first few steps of an activity and may ease initially and then worsen throughout the day. To find out more about footwear or orthotic intervention for plantar fasciitis, please contact us or fill in the form on the right of this page to schedule an appointment at our Mississauga or Guelph location with a Certified Orthotist. There is no charge for the assessment and we can provide you with all of the information that you will need to make an informed decision. You can also call (905) 828-2969 or toll free 1-866-829-2969 or email lindalaakso@customorthotic.ca.